Don’t leave the fun out of your refit—make sure your cruising crew knows you just put in satellite TV. 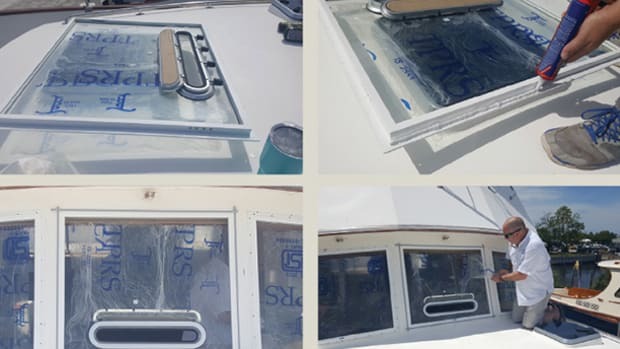 When you own a boat and decide to refit it, you have a distinct advantage: You already know how you use your boat, and also how you want to use it. 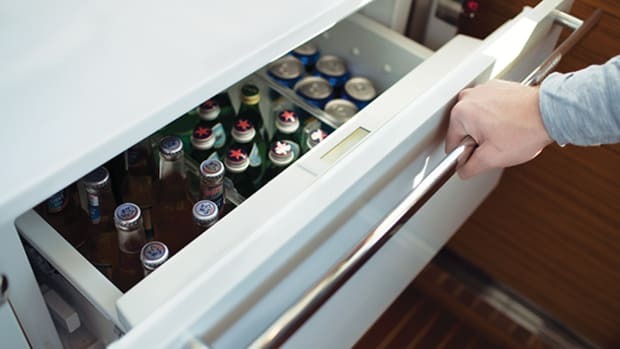 And so choosing the appropriate onboard equipment is simply a matter of matching up your goals for the boat with the available equipment (and, of course, your budget). 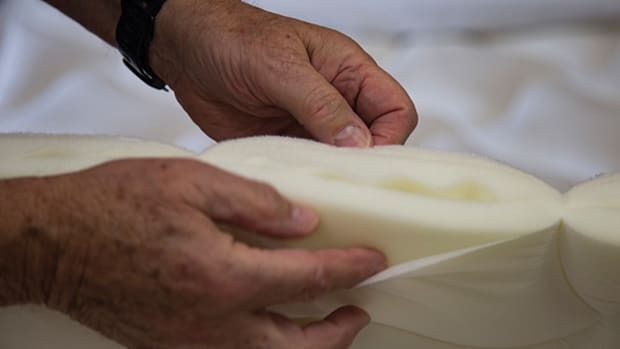 That’s what happened when the MyBoatWorks team made up its wish list to equip Arawak. Arawak, if you’re just joining the fun, is the 1996 Grand Banks 42 Motor Yacht that is the centerpiece of the MyBoatWorks project, which is all about preparing a real boat for real cruising, and eventual charter service. 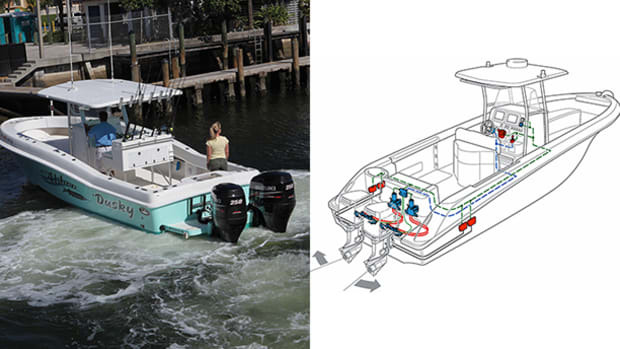 The Arawak team and Mastry Engine Center (www.mastry.com) repowered Arawak in St. Thomas with a pair of new Yanmars and further extensive mechanical and electronic work was performed at American Custom Yachts in Stuart, Florida. 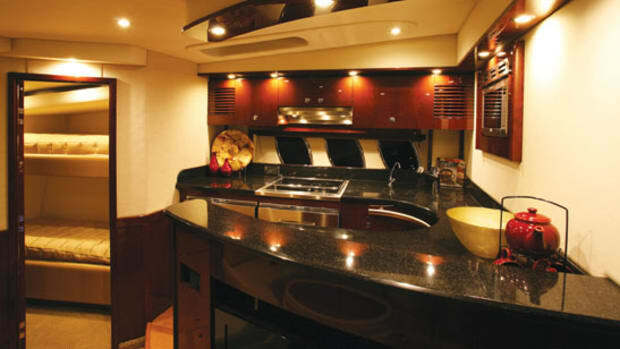 (www.americancustomyachts.com) Her hull was then painted at Yacht Service Ltd. in Amityville, New York (www.yachtserviceltd.com), and she has begun to tour the boat shows. Get all the details and sign up for updates at www.betterpowerboat.com. So while the team has focused for months on the nuts and bolts of the project, getting Arawak running well and efficiently with her new engines, they are now turning their attention to some of the creature comforts that will hold her in good stead on the charter market. A satellite-television system that would work throughout her range topped the list—realize that there are very few days without a sporting event or world-news incident someone on board may want to see. 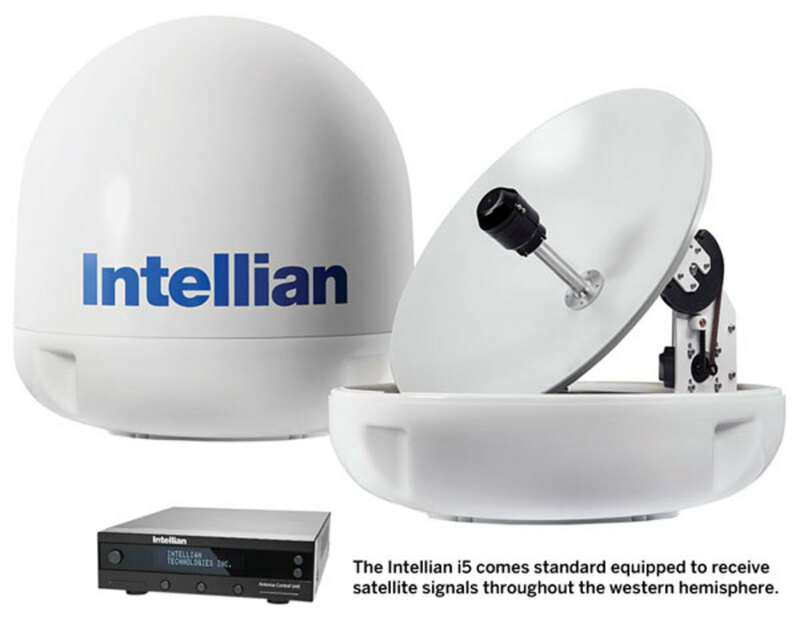 Outfitting a cruising boat under 50 feet with a satellite-TV dome antenna presents numerous questions and the i5 system from Intellian Technologies (which comes in at a price of $5,995) seemed to answer a number of them. 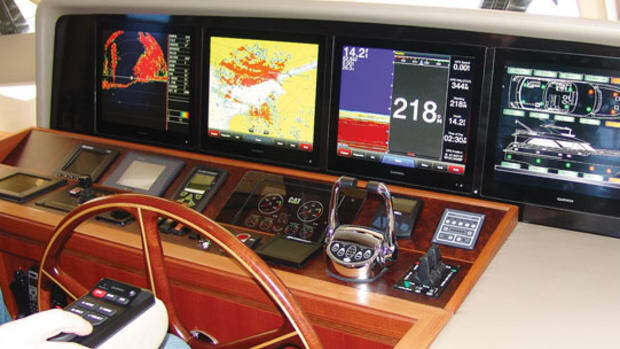 First off, the system was designed very specifically for boats of the size and cruising capability of the Grand Banks 42 Motor Yacht, which can reach the outer islands of the Bahamas and deep into the Caribbean with ease. “For anybody who’s going to the Bahamas or down to the Caribbean in the winter time, for a long time you had to make the physical choice between size and performance,” says Matt Galston, product manager for Intellian Technologies (www.intelliantech.com). 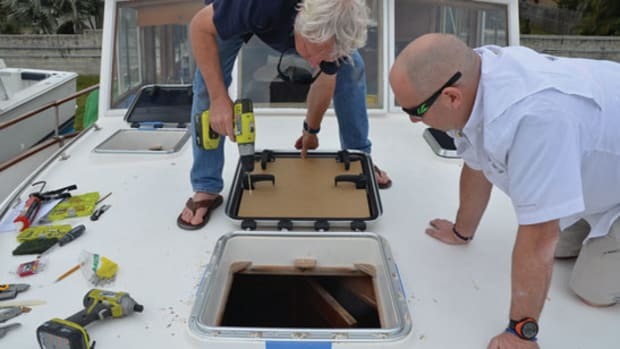 “So Arawak could be the perfect example—a 42-foot boat. Previously the only options from all providers of TV and satellite service would be to get a 45-centimeter dome (that’s 18 inches in diameter—domes are typically classified in centimeters) and the next step up is the 60 centimeter (24 inches), which will perform all the way through the Bahamas. There’s a gap between the Bahamas and down to the Turks and Caicos, and then once you get to Puerto Rico you can pick it up again.” Basically the i5 provides the same coverage, but in a 53-centimeter (20-inch) dome that fits the aesthetic profile of boats in this size range. Now hold on a minute, you may be thinking. Aesthetic profile? What’s next? Flower arranging? Keep in mind: Since this is a dome, that 4-inch difference in diameter means 4 inches larger in every direction (width, length, and height). And if you put a dome that’s sized properly for a 60- or 70-footer on a 40-something-foot boat, it’s going to remind you of the time your kid brother tried on your football helmet. At the same time, a cruiser like Arawak can go wherever the big boys go. But here’s something the big boys have always known about satellite-TV domes that you maybe didn’t know. In the past, they weren’t automatic. 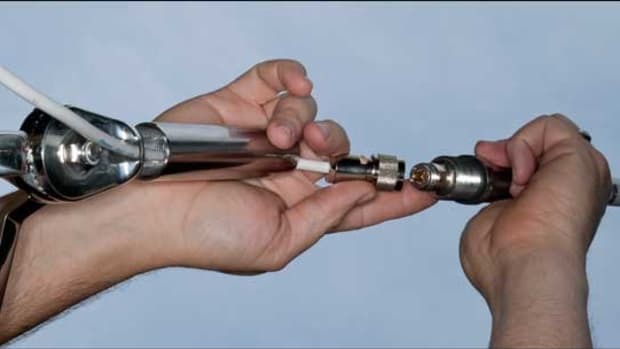 In fact, for years, the LNB (low-noise block) had to be swapped out when you went from region to region. The LNB is the centerpiece of any given system, gathering the microwaves from the dish and downconverting them to the frequency usable by the system’s receiver. Anyway, yachts with satellite-TV systems had crews to deal with this by scaling the mast or otherwise tinkering with the dome to change the parts out as they went from region to region. Recent developments make this no longer necessary. “We’ve equipped the i5 as standard with what we call our All-Americas LNB,” Galston says. “Usually that’s an optional thing that you have to add onto an antenna and one reason that’s important is you do have a Ka-band LNB that works in the U.S. for DirecTV and then if you went down to Latin America you’d use DirecTV Latin America. so you would actually have to climb the mast to swap out this component if you go down there and then everything will work fine after that. People have been doing it for years. 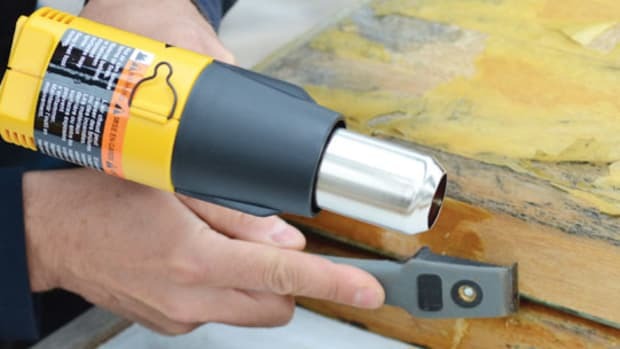 It’s not a huge pain, especially when the boat has a mast like Arawak’s that can drop back and work on the antenna with relative ease and safety. This unit is Intellian’s own design and the All-Americas LNB works with DirecTV U.S., Dish Network U.S., DirecTV Latin, Dish Network Mexico, and it also works with Canadian providers—Bell TV is a big one up there.” So now not even the crew needs to climb. 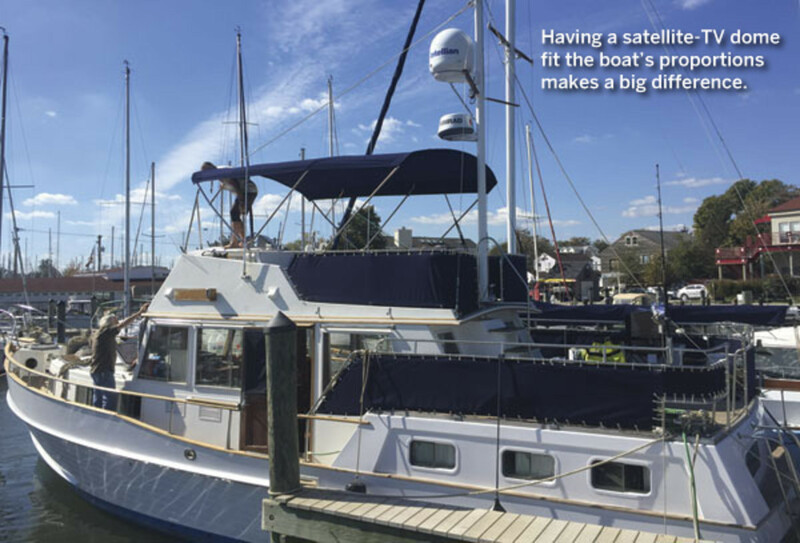 The MyBoatWorks team used a mount from PYI (www.pyiinc.com) that has a platform for the radar below and the satellite-TV above. By pure luck the mast, the television in the aft port corner of the saloon, and the battery bank in the engine room were all located in close proximity for easy wiring—a few holes drilled and trim panels dropped gave access to wire chases for simple connections.